I assume it's an advertisement, but I can't quickly find anything that tells me what it's an ad for or if it's something other than an ad. So that leaves me assuming that "RS" stands for "Really Stupid" as in, "It's really stupid to put something on a tag without explaining what it is." That's a sponsored tag, and I didn't know ServerFault had any left. The RS stands for Right Scale, though you wouldn't know from the icon. If you go to StackOverflow's tag page you'll see several that are similarly iconified. As I understand it, vendors can pay to sponsor a tag. It'll get their logo on the tag. 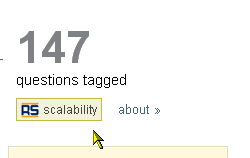 RightScale appears to be camping the Scalability tag. It's a sponsored link that RightScale have presumably paid for. How do I answer a protected question?